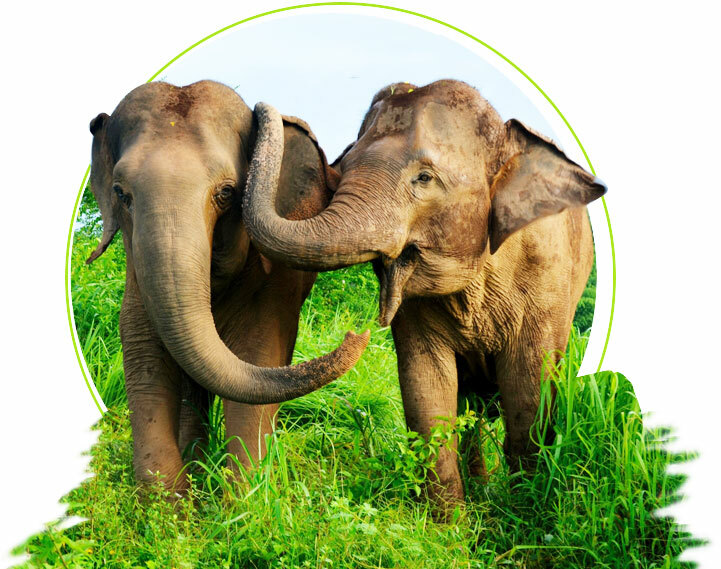 Are you interested in meeting Indian Elephant? Excited to meet me in my natural habitat! I’m one of the biggest land animals of the planet. Indian history is full of my glorious tales and importance. Even Lord Ganesha – the lord of wisdom bears my head. I mostly seen throughout the Asian subcontinent mainly India, Sri Lanka and also to the southern part as well as east till Sumatra. When we walk in the herd, the females normally lead the whole herd. Because of great intellect and wisdom I have cultural and religious importance, also have important significance in Indian Mythology. That’s why India has declared me as Indian Heritage Animal. How does Indian Elephant look like? Friends you can easily recognize me by my lengthy, uncouth hairs thinly covering my body. My skin is little brown to shady gray. I’m one of the biggest land animals living on the Earth. I have long legs of the front and has a thinner main body. I have 02 finger type makeups at my tip which permit me to do both fragile and influential movements. I forgot to tell you about my trunk that is most important part of my body which does my all the most significant works very easily. The male is about 2 meters to 3.5 meters as shoulder height and the female is with 2 meters to 2.7 meters in shoulder height. The weight of an adult male elephant is upto 5,000 kgs and of female elephant weighs about 3,000 kgs. 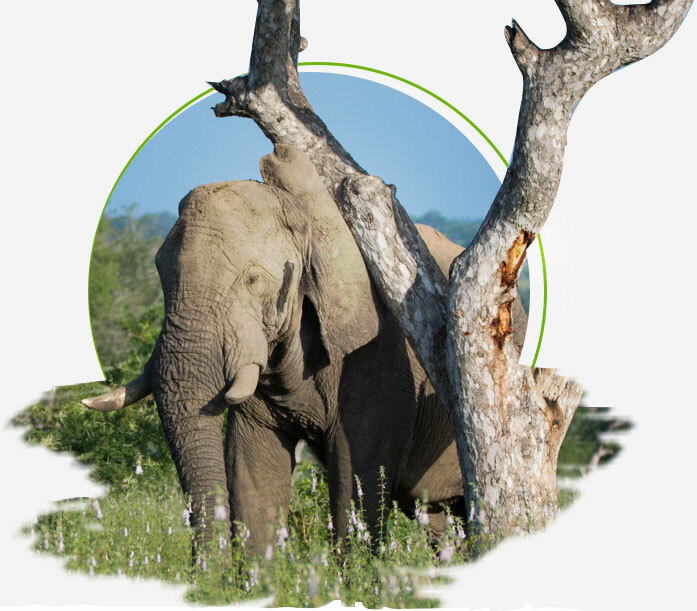 I’m renowned from the African Elephant by the smaller size, ears, little more round back and also toenail on my back feet. I have thick, very dry skin along with a little amount of rigid hair and my color is from grey to brown. I mostly seen throughout India, Sri Lanka and also to the southern part as well as east till Sumatra. When we walk in the herd, the females normally lead the whole herd. I’m human friendly. I can run with the top speed of 43 kilometers per hour. My natural life span is between 55-70 years. After the gestation period of about 22 months, a female gives birth to a single baby. Just one baby is born of weight about 100 kgs. The female usually breeds when they are at the age of 10 to 15 years. At the birth time they can’t see properly, they recognize the mother by the touch and smell. New born baby drinks 3 gallons per day milk up to 2 years. After 2 years, they start to eat plants like the adults. My male mates both get mature at the age of 14 to 15 years and females get their maturity sightly earlier at the age of fourteen years. They can birth a baby at the regular interval of four to five years. I normally eat different grasses, bark, roots, and leaves. I too like various crops as banana developed by farmers, creating a nuisance in farming areas. I can eat approximately 350 pounds of meal in a day. I will have to drink plenty of water each day and they don’t live very away from the water resources. I follow the vegetarian diet and eat grasses, leaves, bamboo, bark, creepers, shoots and palms. I favor seasonal diversity like the leaves of fig and various fruits, the wood of the apple as well as mango. I am quite a sociable mammal and walk from one jungle to another forest, rarely stay at one place for more days. I reside in various habitats as grasslands to damp forests. My habitat is tropical blossom along with dotted segments of woods meadows, areas that frequently differ in between pasture and also near to the waterhole during the summer season. How to meet me in India? Do you want to take a safari ride on my back? Do you want to capture my real life? 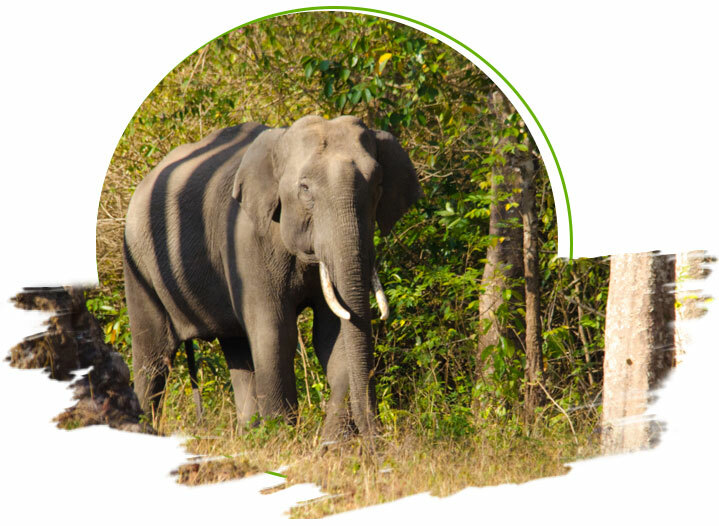 If you want to see me in my natural habitat then you can take an elephant safari in the various national parks like Corbett National Park, Kanha National Park, Manas National Park, Kaziranga National Park, Bandipur National Park, Periyar National Park, Nagarhole National Park. Let me tell you about my most significant addresses! 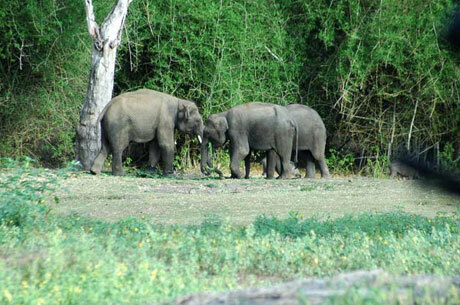 This national park boasts of the maximum population in the country spread in about 694 sq kms. Tala zone is the best safari zone for tigers. 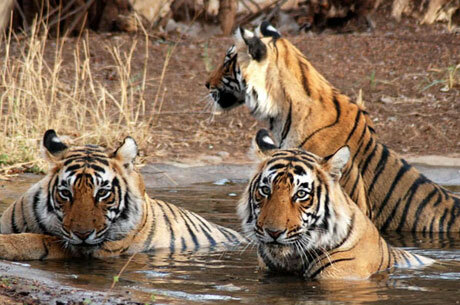 This national park is the home of the famous tigers like Sita, Mohini, B2 and Bamera. 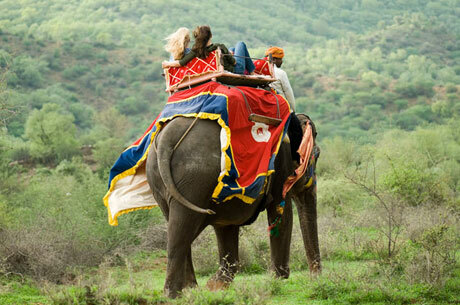 For my sighting Rajasthan is the second as an attractive prospect in India. In this park you will see us basking and ambling in the sun. The semi-desert nature of the park makes it the best place for tiger sighting and photography. Kanha is known as the best place to spot us in India. It is the safe shelter for us. 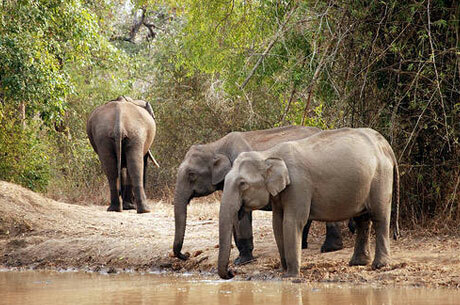 Kanha national park covers an area of 940 sq km across the central highland of the Mekal Rang. This is the best place for a tiger safari in India. It is the oldest park covering around 1288 sq. km. area. Your visit to Corbett can bring you pleasant results because you may get the chances to spot me in my natural habitat. The discovery of new land for the residence by the increasing number of human population across my habitat is currently departing tiny room in their opinion for the living. Hazardous encroachment into protected locations and forests are clearing on the name of the development are about triggering habitat loss and fragmentation. Habitat loss maybe not leaves me without reputable food sources and home; it may also make them more restricted to isolated populations which cannot follow ancient expatriate paths or blend along with different herds. Habitat loss compels me to seek out other food sources from various fauna, settlements, and farms which have substituted my early forests shelters. I am significant but treated as a damaging animal. I can cause millions of dollars of harm to the substantial agricultural field when I get angry. Because of the brutal assaults, I have usually been murdered in retaliation that should stop. I have been hunted for mainly my worthy ivory tusks, just male mates have the teeth. Every single hunting farther skews my gender ratio that comprises breeding rates of my species. Poaching rates are now rising on account of the Asian middle-class fuel requirement in spite of the simple fact there’s just a global ban on ivory trade. 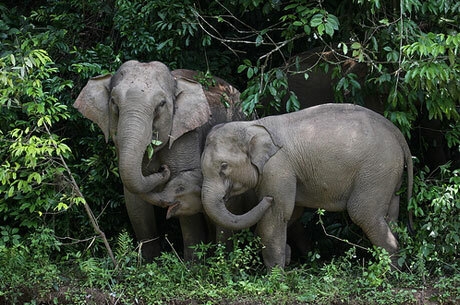 Indian Government has introduced an Elephant Project that is a wildlife conservation endeavor started in 1992 with the try to supply technical and financial support for my leading shelters in the country for the protection of me, my habitats, along with corridors. 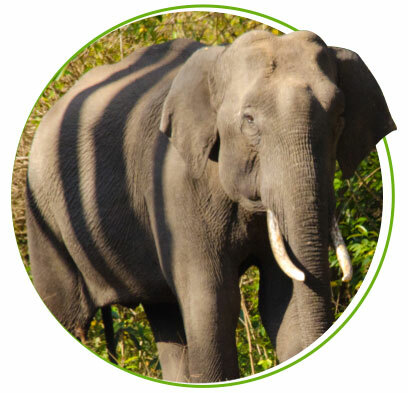 Though the project started from the Indian government with a trust for my conservation inside my populous biogeographical places all across the nation, it enlarged its perspective to embracing a much far more comprehensive method into the subsidiary topics of human-elephant battle and welfare of my pet family mates. Project elephant is primarily comprised the few activities like restoring my current natural habitats and migratory paths, growing scientific procedures for conservation of my habitats and my workable population in the country and making sure that I continuance via proposed direction, encouraging steps for simplifying my battles with the humans in crucial habitats and so much as potential negating the undue pressures of human and regional stock things in my essential habitats, and making specific strictest adherence into “No poaching” acts formulated for me and reducing instances of my unnatural deaths because of person or alternative hindrance, exploration or research on my management related topics, conducting general public training and recognition programs. There are 32 reserves for us in India covering a total area of 69582 sq. kms with our population of about 32000. 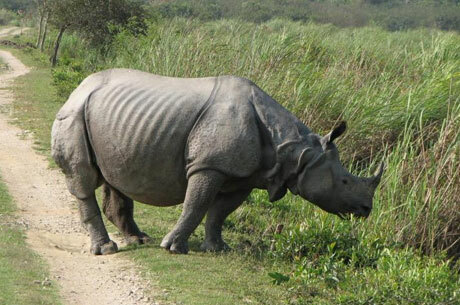 The main reserve parks for us includes Manas National Park in Assam, Kanha National Park in Madhya Pradesh, Corbett National Park in Uttrakhand, Periyar National Park in Kerala, Kaziranga National Park in Assam, Bandipur National Park in Karnataka, Nagarhole National Park in Karnataka. I am one of the few animals who have existence from the very ancient time. My history might be traced back to approximately 2000 BC in northeast India. Ever since that time, I have employed as beasts of weight across India and south-east Asia to entertain, carry crops and humans, to haul logs, and also in conflict by carrying soldiers and arms to combat, whereby they’d trample enemies. My strength has been unparalleled in an era previous to machinery, and also in far more immediate time my usage for the logging market has ever become a significantly less dangerous manner of eliminating wood from the dense forests; in contrast to having trucks, even the dense forests doesn’t have to get flattened to build entry roads whilst me to pull logs involving timber.